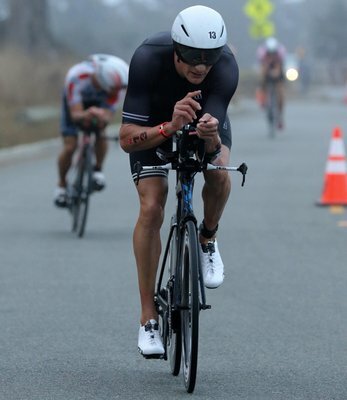 SRM sponsored professional triathlete, Michael Weiss, is powering through 2016! 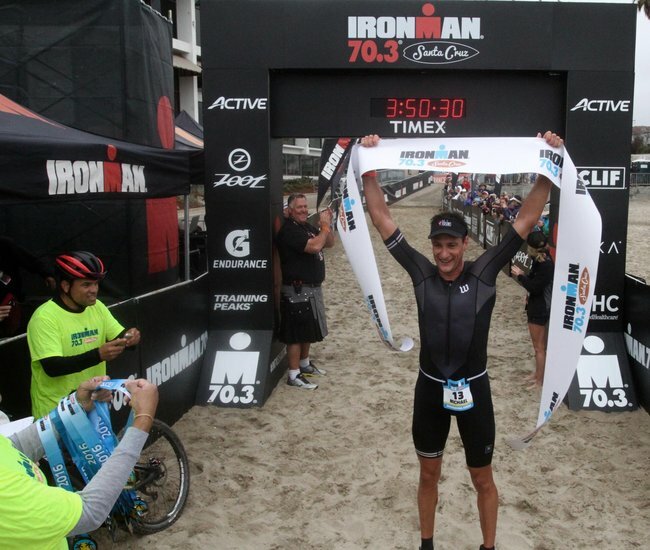 On Sunday the 11th September he dominated a stacked field to win his first Ironman 70.3 event in Santa Cruz, California and in doing so racked up his third consecutive fastest race bike split since mid June with IM 70.3 Boulder, IM 70.3 Timberman and now IM 70.3 Santa Cruz. Clearly his training has been going very well this year, his equipment is dialed and this year’s ‘Road to Kona’ is very much on track. 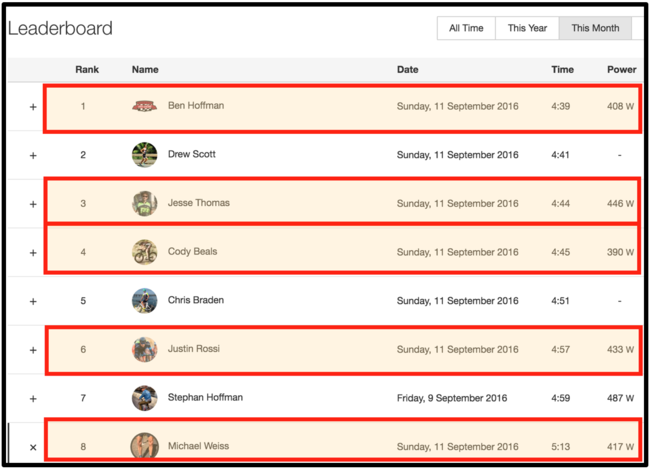 In this article I want to unpack Michi’s SRM race file and also now that we are at long last seeing more of the sports’ top athletes opening up their training and racing power files for us via the likes of Strava, I want to use some of those to make some interesting observations on race strategy. 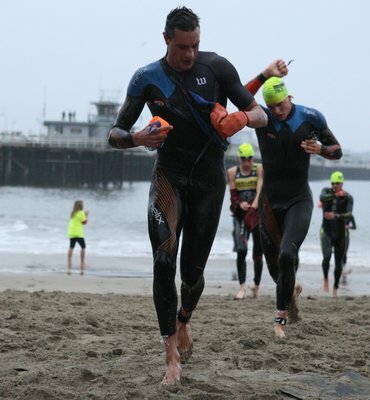 There should also be plenty here for age group athletes to take away and incorporate into their own triathlon preparation – understanding and using power to improve performance really should be as simple and straightforward as can be. 1. Chasing. 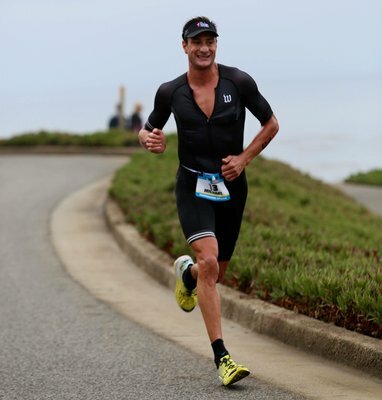 Michi exited T1 with a 3-minute deficit to the leaders so he was immediately into chase mode. Whilst it is tempting to push extremely hard at this point when the legs are fresh, it is essential than an athlete knows what power he can meter out without overly draining limited glycogen reserves, sometimes referred to as ‘burning matches’. This is where an SRM powermeter comes into its own as it allows the athlete to go right up to that known limit in the happy knowledge that he is racing smart – in Michi’s case this is 370W-380W for up to an hour if needs must. Indeed, for the 17 minutes it took Michi to catch the first group of front pack swimmers, he averaged 378W (Normalised Power) - perfect pacing of a very specific and strategic effort. “It was evident early on that Weiss was having a flawless race and the remainder of the field was relegated to fighting for 2nd and 3rd places”. 2. Recovering. For the next 20 minutes we can discern from the trace that in relative terms, Michi allowed his cadence to rise and watts to fall – he averaged ‘just’ 342W (NP) with a cadence of 86rpm versus his usual 80-82rpm). This period of relative ‘spinning’ allows some recovery before the next upcoming effort. The fact that Michi can partially recover when in the pace line is impressive in itself because for the majority of his competitors it is clear that just holding position in the line puts them at their physiological limits. This means that they cannot attack out of the group and are destined to follow for the duration of the bike course. This extra capacity is really what defines and separates the handful of ‘uber cyclists in pro triathlon, giving them options in race strategy which are simply not available to the majority. 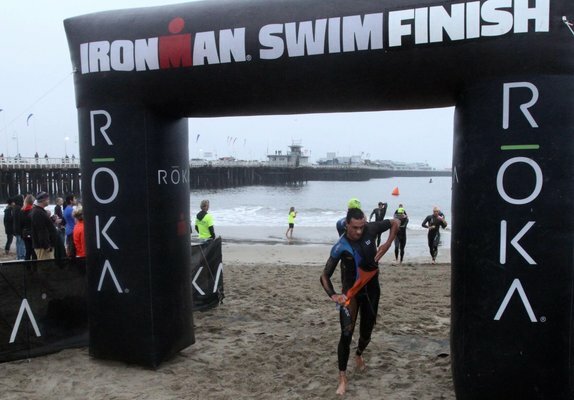 It also should now be very clear that knowing the course inside out is essential at the pro level, but I would also suggest that course recceing pre-event would greatly help age group athletes too, not only in terms of safety but also as a very real performance enhancer. 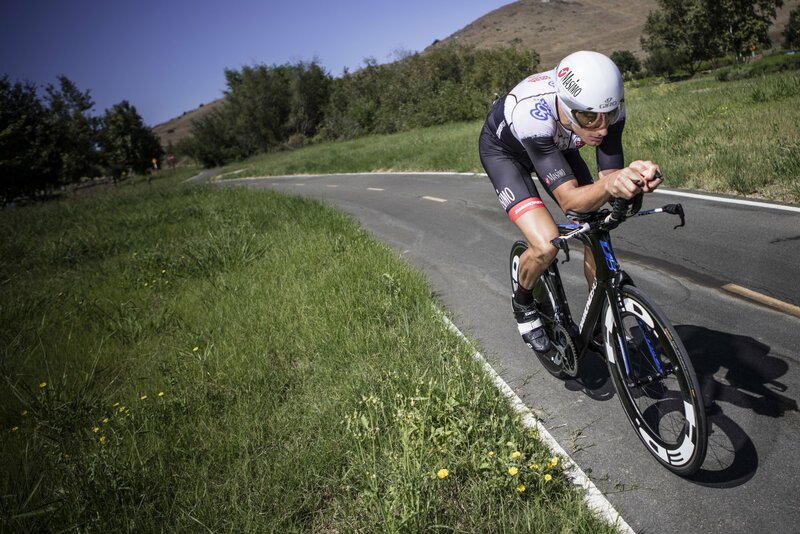 “Whenever I looked down at my SRM PowerControl I was just seeing 400W plus so I knew it was going to be a good day”. 3. Climbing. The only climb of note on this course is the Swanton Road (S side) segment as denoted in Strava – see below. While just 1.6km at an average of 7%, it is of interest to me because if we go back to what I alluded to in the previous paragraph, it becomes clear the group of leaders still ahead of Michi at this stage, were essentially sucked into riding too hard up this climb because no one would have wanted to lose position, such is the group dynamic in these situations where being dropped would lead to a much slower overall bike time and so what often occurs is that everyone over protects their own position and the whole group is taken deep into the red with poutentially negative consequences later in the day when run performance gets examined. Michi’s Swanton Road Effort – Cool, Calm, Measured. 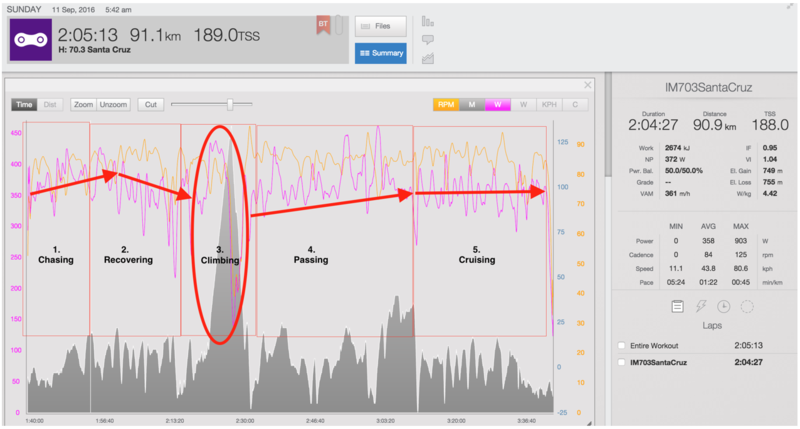 Michi did not take the climb easy but his effort represented little more than a 5-minute threshold effort. This barely constitutes ‘a burnt match’ and not only protected his carbohydrate fuel stores for the run, but when held up against the relatively much harder individual efforts made by the members of the lead group up ahead (see table ‘How Deep Did Everyone Go?’), may well have been the moment, physiologically speaking, that Michi turned the tables on the competition. Certainly come the run, no one was able to close the gap, indeed it widened with Michi putting time into every one of his main competitors. 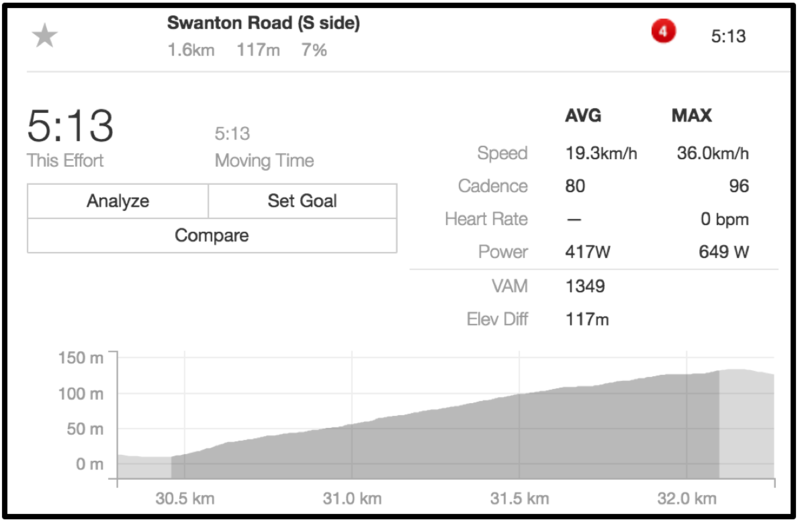 Swanton Road (S Side) Climb – The Leaders Pushed, Michi Cruised. How Deep Did Everyone Go? The two key take-aways for me from this table below are firstly just how hard the athletes with the true cycling pedigree – Michi and Rossi – are able to push themselves when doing what comes naturally. 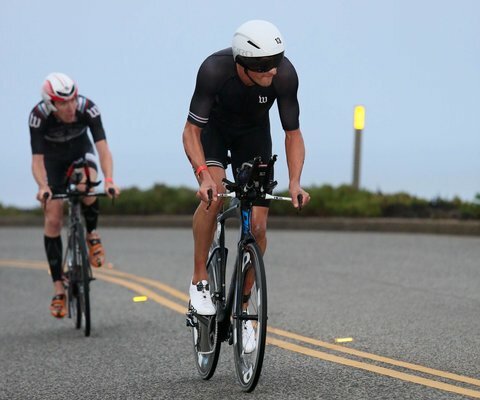 As a comparison, an average, trained age group athlete can sustain IM70.3 race power at around 70-80% of their individual FTP. 4. Passing. This phase was the most impressive. For 31 minutes Michi averaged 371W and because it involved multiple overtaking moves where an attacks into and out of the 12 metre drafting zone were required, that meant that the peak power numbers you see below for this section occurred many times over and as such Michi’s Normalised Power for this section was a mind-blowing 380W! 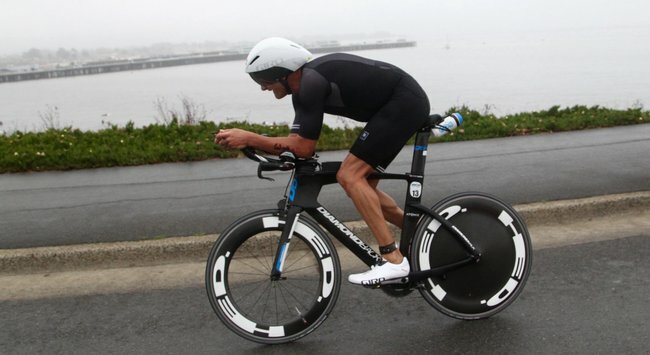 The fact that he was able to do this marks a high point in the development of his bike performance capability and represents a level that perhaps three or four other guys in pro triathlon possess. Uber biker territory indeed! 5. Cruising. When flat, the last 30km of any bike course is always a very interesting and indicative segment to examine. This is because fatigue is playing its part at this point as well as the fact that a hard run is looming for the athletes. This combo tends to manifest itself in a downward sloping power trace (and often an upward sloping cadence trace) as the athletes, consciously or not, freshen their legs up for the subsequent run. Of course, ideally you want the athlete to maintain power, and thus speed, until the end and then still have the metabolic and muscle endurance to be able to run to his potential. Note the large drop off in power in the group of Beals/Hoffman/Thomas. These athletes had ridden together for more or less the whole bike course and other than going into the red for 5 minutes on the Swanton Road climb they had a pretty steady ride. Even so, none of them was prepared, or able, to attack out of the group and go up the road on their own, suggesting that they were at their limit just staying in the group. But all three of them were then able to run excellent half marathons off the bike, which tells me that they did indeed pace themselves well on the bike and then had the necessary metabolic and muscle endurance to nail the run, albeit doing so without having demonstrated especially strong bike legs (all is relative of course as what these guys do at this level is very special indeed!). Justin Rossi, was the only athlete able to follow Michi after all the passing moves were made and in the table above we can see that doing so required 20W less than Michi was putting out in order to travel at the same speed. Certainly Rossi was drafting legally and maintaining the 12 metre zone but if anyone has any doubt as to whether 12 metres makes any difference, look no further – IT DOES! However, when it came to the run, Rossi had no bullets left. 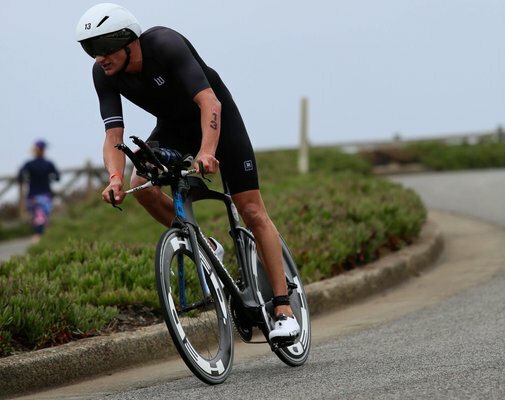 This is because he has relatively recently made the transition to triathlon having spent much of his career as a very able professional cyclist, but to perform on the run at this level you need to have put the running time in and this takes years not months. And so, of the group, it was only Michi who had the big guns on the bike as well as the run – he ran the fastest split of all the main contenders – and this shows excellent, base condition, metabolic endurance, muscle endurance, top end anaerobic capability and the mental facility to win coming from behind. 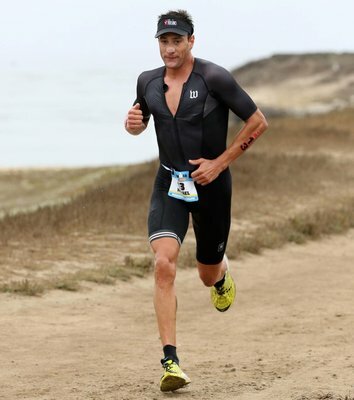 Weiss is ready for Kona! 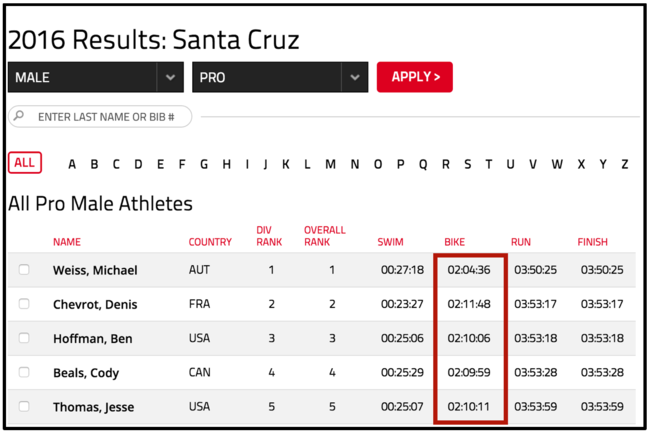 As always we would like to thank Michi Weiss for his power transparency and also salute those top professionals who are embracing Strava and other social media, allowing us mere mortals a glimpse into how these incredible athletes do what they do, not only in races but also day to day in their training. 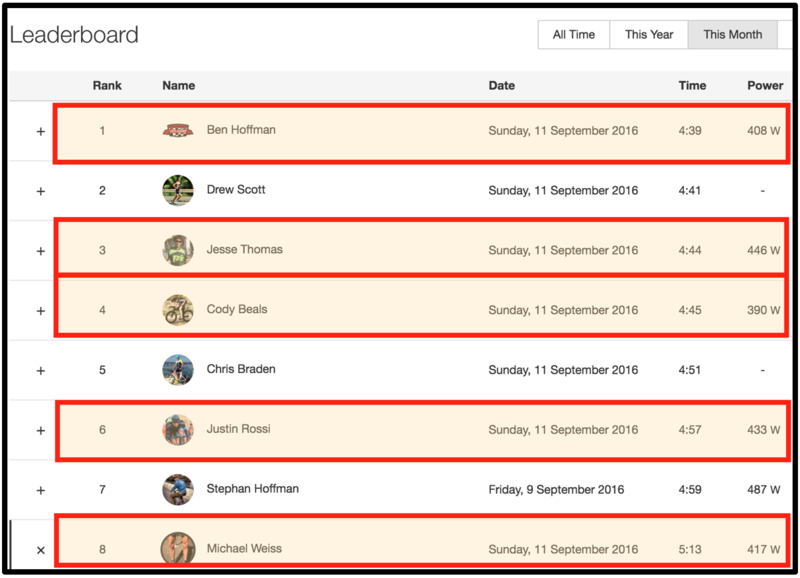 If you want to learn how to race faster, you should start following the likes of Michi, Rossi, Beals, Hoffman and Thomas on Strava. You will learn a lot not least just how much work is required to perform at this level. I know Michi would like to thank his sponsors who provide him with winning equipment namely SRM Training System, Diamondback Bicycles, Giro, Masimo, and GQ-6.